Another week has flown by and it's time for another WIWW post. Oh look, I wore denim shorts and flip flops again. I didn't think so (y'all know me too well). Be sure to visit The Pleated Poppy for oodles more fashion-y fun! Mine would be short and sweet too: yoga pants, yoga pants, and more yoga pants! I even wear them to the office if I plan to be behind my desk writing a grant all day, with no clients in sight! 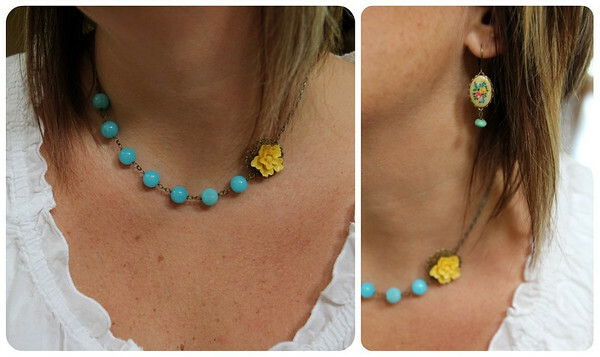 I am really coveting that mustard necklace! Okay thanks to you I just stopped by Funly Vitnage Lovely and bought 4 bloomin bookmarks. That girl should be giving you comission for referrals! You're cute and stylish as always! well don't you look darling! i've taken a little break from WIWW...keep forgetting to snap a picture. so bummed. thanks for linking to my shop. and...I've been wearing cuffed denim shorts all this week. I refashioned a few pair of my favorite jeans that I didn't like the boot cut bottom on anymore. I'll take pics for sure this week and post next week. Then we can be twinners in our denim shorts and flip flops!! Your jewelry is just adorable! :) I especially love the first necklace! Love your shorts, and I'm right there w/ ya on the jean shorts and shirts! Stacy R. : For the multi-pic in this post I used Picnik.com to make a collage. Most of their photo effects are free and quite simple to use. Good luck!